Although Jordan Kroeger (bass) and Ryan Ogburn (mandolin) began their musical relationship in the Wisconsin jamband scene, Chicken Wire Empire began as a 4 piece traditional bluegrass band. The band honed its traditional sound, encapsulating it in 2014 with their debut album Chicken Wire Empire. With half of the group rooted in bluegrass, and the other half steeped in jamband music, a change occurred when CWE performed an Old & In The Way tribute show. 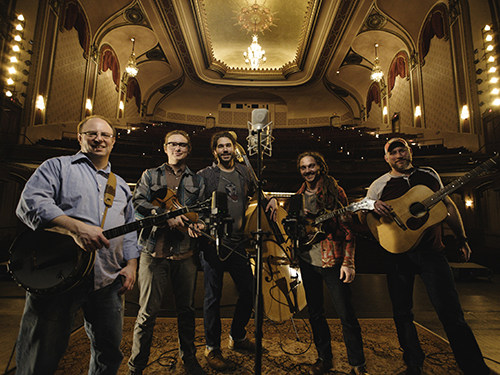 With the addition of Jon Peik (banjo), Ernest Brusubardis IV (fiddle), and Greg Brundage (guitar), a new sound was found in Milwaukee, and Chicken Wire Empire joined the roster of high energy jamgrass. This journey from traditional to progressive was documented by director Ross Monagle in the film All It Takes, and premiered in 2016 at the Oriental Theatre in Milwaukee. Featuring interviews with each band member, (and a surprise visit from one of the band member’s alter ego) the film follows the band around Wisconsin, playing in several clubs, and includes performances of 4 originals and a fiddle tune in Milwaukee’s historic Riverside Theatre, recorded and mixed by sound engineer Sam Donoghue. Exhausted from video editing, the band returned to the studio, recording their sophomore album What Moves Mountains. Featuring a mixture of originals and some reimagined covers, What Moves Mountains was recorded at Axis Recording by Vinny Millevolte, and mastered by Justin Perkins. With support from their family and friends, What Moves Mountains was released January 1st of 2019. Chicken Wire Empire has been blessed with opportunities to share the stage with renowned musicians (Yonder Mountain String Band, 30db, The Big Wu, Horseshoes & Hand Grenades) and performing in many regional festivals (Blue Ox and Boats & Bluegrass). With support from their local scene, friends, and families, Chicken Wire Empire looks to the future, with a goal to strengthen Wisconsin’s bluegrass scene, and further the appreciation of acoustic music.